Simply put: this is for the beginner who wants to plug in and play. Distinctive white design and charisma. Limited tonal range and untidy finish. 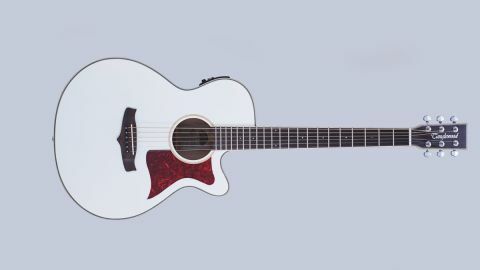 The Tanglewood Winterleaf TW4 WH is white. White guitars conjure up the image of the austere lone guitarist, dressed all-in-black, casting a stark duo-tone stage presence with their immaculate instruments. They signify something other than white cars or vans, which either represent an 80s fad or the jobbing removals industry. On the other hand, Steve Vai inspired generations with his white Ibanez JEM sporting the monkey grip. Even James Hetfield’s ‘EET FUK’ ESP Explorer was white. Maybe white guitars do break the mould. We’ll find out if Tanglewood’s latest acoustic offering can do the same. Apart from being white, this Tanglewood Winterleaf TW4 has a super folk cutaway, a solid spruce top and mahogany back and sides. The normal thing to do at this stage would be to tell you about the grain and hues of the wood, but this time the white gloss finish prevents us from doing so. Some of the finer details on the guitar do reveal some of Tanglewood’s signature nuances, which in turn give this Winterleaf range of guitars their distinctive flavours. The rosette is a simple singular ash blond maple band around the soundhole. The binding is maple too and runs the full length of the mahogany neck, either side of a rosewood fingerboard. Contrasting with this light colour palette, the red tortoise-shell pick guard stands out a treat. The top of the headstock shows some mahogany, which has been stained a rich, darker colour with the grain flowing upwards and (seemingly) outwards. It is embellished with Tanglewood’s cursive typographical logo and sports silver Chrome Grover tuning heads. Similarly, the rosewood bridge, with its more natural finish, appears almost black against the white gloss, though up close it has a deep charred earthy hue. Overall, the Tanglewood has a crisp appearance and out of the box (no gig bag is included, so if you think of purchasing you’ll certainly need to get one) is a surprise and joy to behold. Even the handful of people (non-musos included) who see me testing the guitar remark on its distinctive appearance. On closer inspection the pristine white is somewhat besmirched by an untidy finish at the join between the neck and the body. The same untidy finish can also be seen on the underside rim of the soundhole. This is a shame but at £349 this guitar obviously isn’t aimed at the fully-fledged-ready-to-take-the-world-by-storm musician, who requires immaculate construction. The price bracket pitches this guitar at the beginner or those wanting to dip their toes into something more advanced than a basic sound box - so the need for an absolute pristine finish is somewhat negated. In the left hand the neck feels hard. The gloss finish doesn’t help with swift transitions up and down the fingerboard and the thumb feels sticky or tends to drag. The strings feel taut and lack the full flexibility we’d like for solo playing. Bending the strings for instance, becomes a much more difficult exercise. The cutaway, however, does give some light relief for the left hand. Pitching this guitar against another with similar specs and cutaway (in this case a Yamaha FG Series FSX800) we find that the cutaway shape of the Tanglewood allows more access at the top end of the fingerboard - no stretching, even for the final 21st fret. Normal fingerstyle playing doesn’t extract the best sound from this guitar. At a first impression: the tones it produces, acoustically, veer towards the treble end of the sound spectrum. It’s fine for light playing or sounding out a melody for compositional purposes but it doesn’t give you the full tonal range for deep soloing. Playing over the fretboard does give a softer tone and playing by the bridge does give a harsher sound but the extremes needed for exerting advanced musical prowess aren’t quite there. Playing with a plectrum produces a more impressive tonal range, sound and volume - so we’d recommend sticking to that for this model. Another simple solution might just be to readjust the truss rod with the key, which comes with the model. While there’s a limited tonal range available, the light D’Addario EXP16 strings produce a very even tone. This could be due in part to what’s going on beneath the top of this guitar. Here you’ll find Michael Sanden’s tapered bracing system designed to provide uniform tone and long sustain. The tone we’ve already mentioned, but as to the sustain - it is when you play harmonics that your eyebrows might raise significantly. The harmonics are some of the strongest we’ve ever heard: they ring loud and clear with some impressive sustain. This could be due to the choice of saddle, which is made from Nubone, a product known for delivering clear high sounds and increased harmonics. The guitar’s super folk shape is very comfortable for the right arm. Described by Tanglewood as being a ‘little like a mini jumbo size, very similar to a folk but more rounded at the bottom bout’, the right hand falls naturally over the soundhole and there’s plenty of space for plectrum or fingerstyle work. While the mahogany back and sides might favour blues or roots playing, they make a reasonable go of some jazz Dixie standards - from the Muskrat Ramble to the Tin Roof Blues. Plugged in the guitar comes to life - it provides a strong, direct tone. The B-Band M-450T electronics give you sonic control with three-band equaliser and a Presence slider so you can custom-make your sound. The preamp also comes with an indispensable tuner, so you don’t have to worry about stray tunings. It has a HZZless preamp circuit too which helps get rid of circuit noise and increases the signal output. As always with this sort of preamp - always make sure you carry a spare battery wherever you go (with the guitar). We generally find the playability of the Tanglewood to be a little wanting. Initially, it seems less responsive and intuitive compared to the Yamaha, which feels like there might be more vibration and resonance. Whether the painted white wood of the Tanglewood adds another coating which restricts this movement is a question some might raise. However, the Tanglewood has graces the other doesn’t - bending the strings for Chuck Berry licks (while still hard to do) produce less noise on the Tanglewood than on the Yamaha. You’re buying an instrument, which can give you that unique stage presence - and for that, this guitar is certainly worth the price. Tanglewood also produces this guitar in other finishes and colours: black, a dark burgundy red and they are also introducing a new Whiskey Barrel Burst finish - something we would very much like to see, if not sample. The predominantly rigid soundscape of the Tanglewood Winterleaf TW4 provides little in the way of tonal variety for the more advanced player and the finer details on production are somewhat lacking, but again take a look at the price and you can see that this guitar is still worth giving a try. Gone is the phrase Winterleaf is coming. Winterleaf is here.